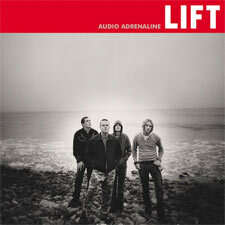 With Audio Adrenaline gearing up for the release of their new album Lift, we enjoyed a chance to chit chat with the band's tired and indecisive guitarist Tyler Burkum. This interview took place on: 10/28/01. Jesus freak Hideout: You have a new album releasing next month entitled Lift. Artistically, how would you say this album differs from previous recordings? Tyler Burkum: I think the record is more melodic. I think it's got a great theme. I think there's more songs on there that I really really like. I like a lot of it. I like this record more than any other record I've been a part of. It's a different record for us. 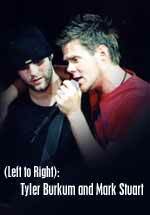 On the record, me and Mark sing a lot more. There's a lot more of us singing together. He'll take a verse and I'll take a chorus or I'll take a verse and he'll take the chorus. So it sounds different and that way, but in a weird way it still sounds like Audio Adrenaline. JFH: What would you say would be the theme for the record? Tyler: It's kinda like how if you lift God up. But not only God, there are many ways you can take it. Like how God lifts us up. There are many surface-level ways to take it. The whole thing is kinda how when we lift Christ up to people, we don't have to explain what God is. If you just worship Him and just point to God, that's enough. It's weird cause through the record there's this kind of like this underlying feeling of hope on the whole record. And it wasn't even like we tried to do that. It was just kind of there-- this hope and a kind of a peace the way God lifts us up. The record is kind of like what happens when you worship. It's not really worship music, but what happens when you worship. JFH: What inspired the song "Ocean Floor?" Tyler: I had the chorus idea and I just had lyrics to it, but it wasn't even supposed to be on the record. I was just playing it for Mark and Mark was like "Dude, we need to do that!" So he wrote the verses and I wrote the chorus. It's using a really powerful image of how God washes away your sins. But not only just washes away... It's like you're using the strength of the ocean, the mystery of the ocean, the washing away of the ocean. It's using all these metaphorical ways of how God devores your sin. The ocean just swallows things, and just takes them and their gone, y'know? I've always thought the ocean was so powerful. You know how you just go somewhere and the ocean just looks like "Whoa I don't want to get to close 'cause I'm gonna fall in and I'm never gonna come back." When I was a little kid I saw this devotion about how this old man who's supposed to be like God, took your sins and he covered them with chains and locks and just rowed his boat out into the middle of the ocean and pushed it off and it was gone. And I always thought that was just the coolest thing. So from mixing that with the ocean and how powerful the ocean is. And there's a freshness too. There's lots of ways the song can be taken, but the main theme is just how God can take your sins and they're gone, just drowns them and they're gone. If you screw up, God can take it, the high tide will come and take it away. And it's kind of like the ocean's always going to be there, you know what I mean? It's kind of like a force to be reckoned with. And I just thought it was kind of cool to think about God being so powerful and you know how God can be so peaceful. But also thinking about how God made the ocean, too. And if He can make an ocean, He can forgive your sins, you know what I'm saying? JFH: Yeah, is that kind of where you got the cover theme? Tyler: You know we didn't. That was weird because we did a photo shoot and that was just one of the things. We did like fifteen different places and we're just kind of like "Oh let's go here, stop and get some pictures here." And we had that song recorded, but we didn't even know it was going to be on the record. We thought this might make a cool 8 by 10 or something. Actually the whole cover theme got completely changed. We were actually doing pictures just for the cover, and none of those pictures made it. JFH: Were they the ones of you guys dangling? Well, the original theme was we were going to have this street in L.A. with tons of people walking and we're just floating above them on the street. It just somehow ended up being that. It was not to make a big deal about being "lifted," but how we're just barely floating. JFH: What is your favorite song from Lift? Tyler: I do not know. I really like "Ocean Floor." I think I like that song just because it's so personal to me. I like "Glory" a lot. I kinda forget which songs are on there. I'm so used to doing a record and have like three really favorites, y'know? On this record I just like a lot of them. And it's not "liking" it like "Oh man, that's cool, that's gonna be a big hit!" Which is really just being pleased with them. Almost kind of like if none of these songs become big hits I don't care. *grins* I really like them. *pauses to think* You know what? "Speak to Me." I love "Speak to Me." Yeah "Speak to Me" and "Ocean Floor" are my two favorites." JFH: Do you have any videos planned for any songs off of Lift? JFH: Where were you and what were you doing on Sept. 11 when you first heard about the tragedy? How has it impacted you? Tyler: I was actually at home drinking a cup of coffee watching the news. I always watch the news in the morning. I take my wife to work in the morning and watch the news. I had just dropped her off at work a little early, right when the first plane hit. And she works right by our house, so I was on my way home and I was almost home and I hear on the radio that a plane hit the World Trade tower. The way they said it and everything, there was no panic. And it sounded like a small plane hit. And I felt worse for the people in the plane. So I walk in and I turn on the TV and they show a picture of it, and that's when the other one hit the Pentagon. And all of a sudden it's just panic. It was just pure panic. Y'know, it was like six minutes when you were not sure what was going on and then it was like panic! And then I watched all the rest of it all happen live. It was the first time I've ever watched the news and just cried. Like when the first tower fell, I was just cryin'. When the first tower fell, I was praying for the other tower, praying for the people in the tower. And then that one fell, I mean... I was on the ground. I just didn't understand it. Like now I'm not really freaked out at all, but I didn't know exactly what was going to happen past that. I didn't know... "ok now, was this going to happen in all the cities across the nation?" I didn't know what was going to happen. I was really freaked out about that. Y'know, like the first thing I thought was it's Armaggedon or something like that you know? *chuckles* I mean, I just had never seen anything like this before so it just rocked me hard. But then we actually finished the record that day. We went into the studio late. None of us went into the studio till five. Nobody even wanted to go, but we had to finish our record before the tour. *pauses* It's just weird, y'know? We were pretty much in shock. We kinda went on with our lives, but still hadn't realized... The next day, we were talking about cancelling the Festival Con Dios, talking about the tour and everything. It was crazy. So I remember the last day of the studio really well. JFH: What inspired you guys to write this album with a more worshipful focus than previous albums? Tyler: Well, the way we recorded the songs-- it wasn't like we just had them all done like that and we planned on recording them. It was like all the songs just came together like that. We had three or four recorded here, and then we recorded these here, and then we had six and we had to do the vocals and had to redo some of the words and stuff like that. It just all came out. I mean, we did it in chunks. A lot of things are at play. A lot of things manifest themselves in the music you don't know about. There are lots of ways you can try and do a record. There were times when we tried to make a really themed record and it just didn't work. Sometimes it doesn't happen. It's like trying to make a happy song, and if you're not happy playing it, it's not going to sound happy. I think we had a lot of fun making the record. We're constantly dealing with a lot of spiritual stuff in the band. And you really start dealing with a lot of that stuff especially when you start living together in a house making songs. You're even more confronted with it and you put it in the songs. On this record we really tried to bridge the gap between what people wanted and what we wanted. We thought we're never going to make a record that only we like. Every song there's something you don't like that somebody else likes. You have to say "Ok, this is what we're going to give the people, and this is what we need for us." If you can make a song you really like and you know that you didn't just think about yourself, if you can just meet the middleground. That you know you can play the songs, have a lot of fun, and that people will still like them. And you're not selling out cause you're not just for money or people to buy it. Because if you do it for just people to buy it, a lot of times you don't like those songs. Cause they're not songs that you like. You have to go right in between so you can play songs for people and really like them, and you're honestly really liking them and you can put your heart into the songs. It's trying to be unselfish with the writing. You can't be too self-indulgent but you have to think about other people too. JFH: And you guys recorded it in an old house? Tyler: Yeah, we just bought a house in Nashville and turned it into a studio, put tons of gear in it. It's really cool, really fun. That made it for a really low key, low stress atmosphere. It was in a neighborhood. It wasn't like in some business area or something like that that didn't feel homey. I could just come and leave my stuff there. There was a Starbucks just four blocks away. And it was a neighborhood so if you got stressed out you could just take a little walk. It was just really fun. Like Mark would be cutting vocals or something and I would be sitting outside playing acoustic guitar with a friend of mine drinking some coffee. And they'd come and be like "hey, you're gonna come sing" and then somebody else would be hanging out on the front porch. People would drop by and hung out with us the whole time. It was really cool because it made us a lot less fatigued cause it felt like we were at our house. It felt really good. And our neighbors were really cool. We'd talk to them and be like "are we making too much noise?" and they'd be like "Nah, we hear a little bass every once in awhile but we love it though!" JFH: What are your plans for your Spring Tour? JFH: What has been your favorite place you've been to while on tour? Tyler: I don't know. I really love Seattle. See, I love to travel and for me every place has kind of got its charm. I like the South West, I like the desert. I love Seattle, how it rains all the time. I like that! I don't think Phoenix s*cks cause it's hot or that Seattle s*cks cause it rains a lot. I grew up in Minnesota, I like the cold winter, I like the snow. If you can see the positiveness in the Minnesota Winter than you can like anywhere. JFH: Except I hate really hot temperatures. Yeah, I have to say I'm not a big fan of humidity-- Nashville! That's where I live. It is like a mouth. But the Fall... awww... see, every place has got its charm. The Fall in Nashville is unbelievable. It's so nice. The leaves just never fall, they hang on to the trees forever. They're bright orange and they're just hanging there. In Minnesota it's like Jack Frost coughs and all the leaves fall off and it's Winter! JFH: Most inspiring Bible story? Tyler: *thinks... long pause* I dunno, the birth of Jesus is pretty inspiring. Not to be joking. Everytime you read that it's pretty amazing... I don't know. Nobody's ever asked me that and I need to think about that! I mean there's no shortage of them! *laughs* I'll just have to pick one. Tyler: Man, I'm not so good at favorites. I like everything. *thinks then laughs* Nightmare Before Christmas is pretty awesome. No, really, I like that movie. I really do like that movie. JFH: I actually haven't seen it. It's really funny. What would you say if I said like Beetlejuice? You'd be like "Whoa, whatever!" Nah... Y'know I love It's a Wonderful Life. I love that movie, it is an awesome movie. *thinks* To Kill a Mockingbird. JFH: Haven't seen it. Really? Jim: How about The Matrix. The Matrix! That rocks! (John adds: "Haven't seen it.") I'd have to say... Short Circuit! JFH: You're kidding?! Yeah, I am. Shadowlands is a good movie. JFH: Really? Never seen any of these, have you?! *laughs* JFH: Well I've seen Short Circuit! Next question! Fantasia! JFH: Have you seen Frequency? No. See? You pick one I haven't seen! JFH: Food of choice while on the road? Tyler: Like favorite food while I'm on the road? Cause a lot of times I don't get to pick it. If I said "lasagna" I'd be really lucky because that's what we usually get everywhere we go. JFH: Did you guys eat yet tonight? Yeah. JFH: What'd you have? Some kind of chicken thing and then some kind of a sauce with some mushrooms over some kind of a rice. JFH: Was it any good? It was amazing! *laughs* I dunno, probably Mexican food. JFH: Taco Bell? *groans* No, like when somebody makes it. You know what? My favorite kind of food is when we go to a town and they say this is what's popular here. Like when I got to Philly, if you don't go and get a Philly Cheese steak, you're stupid, y'know? You gotta go! You gotta go to South Street and go get yourself a nasty, nasty cheese steak. And while I'm in Philly, that's my favorite thing. When I go to Minnesota, I get pancakes. Ooo, pancakes, yeah. *grins* Jim: Potato pancakes? I love potato pancakes! I love anything that's kind of fatty. The biggest thing is -- anywhere that's coffee. Lot of coffee. Coffee-- that's our food on the road. And Double Stuff Oreos. I like meat and potatoes. JFH: Most embarassing live show moment? Tyler: There was a show where I accidentally got started on fire. *John raises his eyebrow* Yeah, I'm kidding. *laughs* There was a show one time when I tripped and fell on my face. The Supertones had just played. The stage was covered with sweat because of the Supertones. I slipped, fell down straight while I'm playing, slide across the floor on my face, hit a monitor speaker with my head and knock it off stage, and then stand up and act like nothing ever happened. And it looked like nobody even noticed! It was weird. But it was really embarassing, though. That was my most embarassing moment... when I stage-dove with my face. Tyler: *long pause* JFH: Everyone's got a favorite cereal. *keeps thinking* JFH: ...except for Tyler... I just like everything man! When I grew up, there was nothing I wouldn't eat. Nothing! Lima beans, anything! I like it all! I just like it! I'm a human food disposal. "Golden Grahams." "Golden Grahams" are like the junk one, when you just want the sweet ones, y'know? And "Crispix." I'm not a nerd, but "Crispix" are good. I like every kind of cereal. I grew up in a family where we had cereal for lunch! Oh yeah, I'd eat like four bowls of cereal in the morning. 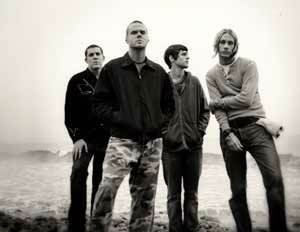 JFH: What do you see the future holding for Audio Adrenaline? Tyler: I think we're gonna keep going. I mean we're not going to try to run into the ground or anything. I just really think we're going to keep going and as long as we still have fun and it's fresh. I mean, I don't know when we're going to stop as a band, but as of right now, especially after making this record, it feels really good. We'll just keep seeing what God wants us to do, y'know? JFH: I think it's your best record. I think so too. Jim: Do you have any personal aspirations on what you want to do afterwards? After Audio Adrenaline? I don't know. I'm so thankful to do what I do now. I can be so happy doing so many other things, too. I don't know. I would love to still do music, I think that would be really cool. But even if I wasn't doing music, that'd still be cool. I think it would be really fun to play guitar with lots of different bands. Or go do my own stuff. I don't really have any delusions of grandeur. Like a lot of people would be like, "You know what I'm going to do after this? I'm going to form my own band and we're going to conquer the world!" I don't feel like that. I'm not thinking about that right now because I don't know what the future holds. I'm not planning my next move. I'm grounded where I am right now. Tyler: I like Switchfoot. JFH: Everybody likes Switchfoot! It's awesome. Yeah, cause I just love Jon and I just love those guys. They're such cool guys. Our manager managed them. I love the Vigilantes of Love. There's a lot of Christian bands that don't get the attention they deserve. There's just tons of Christian bands. You know what I mean? I like Jars of Clay. See, it's weird cause I know a lot of these guys so I think of them personally. I like them because I'm like, "Those are cool guys." You know? *thinks* I'm just sharp as a tack tonight! Elms are pretty cool. We just toured with those guys. I love the Supertones. Those guys are so sweet. Tyler: *thinks* Be sure to bundle up this Winter. I don't know. No, no closing comments. JFH: That's OK. You look tired. I'm really no- I am. I was gonna say I'm really not that tired but I really am. *laughs* We just got back from Canada last night. It was a long day. I got home at about 8 or 9. Went and had supper. Went home, took a shower. Put some fresh clothes in my bag, drove to the bus and hopped on the bus to come here. Tomorrow when I get home I go into the studio with my Uncle. He's producing some records. I'm gonna go play on those records and then get on the bus and go for two days, come home, do some more recording, and then hop on the bus again and go out for two days. JFH: Do you like touring? Tyler: Yeah! I do. I love travelling. *yawns* If I didn't like this part, I should probably find a new job. JFH: Cause it seems grueling. It is grueling. A lot of the time you don't realize how grueling it is till you get done with it. Then you're like "Oh my gosh! I can't believe I just did that." Like when we did Festival Con Dios, you're gone for a month. You don't come home for a month. You just have to shut down. JFH: And your wife's at home so you don't even get to see her? Yeah. I didn't even see her this past month. Partly, too, is because the day I was going to fly to her after the show, was about a week after the whole World Trade attacks. Flying was so uncertain after that. I mean, I've flown so much since then. Probably thirty five times, forty times. It's as safe as it was before. I mean, if somebody wants to kill ya, they'll kill ya. I'm not worried about it. You can't go through your life living in fear about things like that. Now if someone said, "Planes are just falling out of the sky left and right," I probably wouldn't get on a plane. But the chances are when I get in my car and I drive to the grocery store to get milk, my odds of dying are way greater just doing that, or getting mugged when I get out then they are getting hijacked. That's my closing comment. Fly. Everybody, buy a cheap ticket and fly! Save our economy.